Mangroves form a "Green Tunnel" over a waterway. You may not know it from the flat, suburban sprawl, but Tainan is on the doorstep of one of Taiwan’s eight national parks. The Taijiang National Park encompasses much of the coastline and estuaries north of Tainan City. Even within the city limits, sporadic areas are designated national parkland. The Taijiang Ecological Culture Zone functions as an information center and showcase for the park within Tainan city limits. Protected wetlands, ecological museums, as well as historic temples and forts all exist as part of this cultural zone. Dazhong Temple is the anchor for the Sihcao Park and the Taijiang Ecological Culture Zone. The national park mostly encompasses the tidal lands, sandbanks, and wetlands along the coast of northern Tainan County. These estuaries were created by silting over the last few centuries and have become home to a bountiful ecosystem. The main part of this zone is the Sihcao Park which includes Dazhong Temple, Sihcao Artillery Fort, a small whale museum, walking paths, and the docks for boat tours of the mangrove green tunnel and the wetlands along Sihcao Wildlife Preserve and the Yanshui River. Nearby is also the Salt Field Eco-Culture Village. Further afield, but also included in the cultural zone, are the Luermen Matsu Temple, and the Orthodox Luermen Matsu Temple. All of these are within Annan District of Tainan City. Probably the main reason to come to this park is to take the boat tours into the wetlands. There are two tours to choose from. The first is a 30 minute raft ride through the mangrove green tunnel. 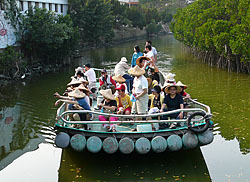 The second is a 70 minute boat ride out into the wetlands and the Yanshui River. This small raft takes you through the mangrove tunnel. The mangrove green tunnel (30 min. 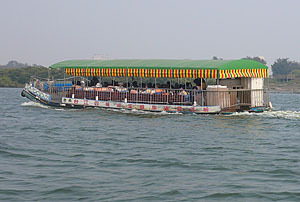 Adult NT$150; Concession NT$100) raft ride takes you along a mangrove-lined waterway. The mangroves form a beautiful tunnel-like canopy over the river. This is a fairly intimate ride that slowly moves along a narrow waterway where you could easily reach out and touch the trees. The ride doesn’t take too long. It says 30 minutes, but really, that is 15 minutes up and 15 back-tracking. There’s a bit of a theme-park hokeyness to the experience, but it’s worth putting up with it for the experience of being inside the tunnel. On an additional note, don’t let the pictures of people in kayaks passing through the tunnel fool you. There are no kayaks for rent. I was pretty excited by the idea of paddling through the mangroves myself, and pretty disappointed to learn that I couldn’t do it. The folks at Barking Deer Adventures, however, seem to have found a way to take kayaks through. The other boat ride is a better value (70 min. Adult NT$200; Concession NT$150). It’s on a bigger, canopy-covered boat that spreads out into more open territory. This ride heads out into various channels, skirting the Sihcao Wildlife Preserve, and then onto the Yanshui River just north of Anping. You’ll see a lot of fishing nets, mangroves, water birds and various other flora, fauna, and fishing activities. A guide gives an informative explanation of the trip, but it’s only in Chinese. The first part of the trip is a little dull, but once the boat hits the Yanshui River, the ride really improves. It pulls in close to many of the sandbanks that are home to dozens of bird species. Along with various egrets and ibises, many spoon-bills and other feathered creatures make their migratory stops here, especially in the spring and fall. Additionally, the views of Anping and the Lakeside Water Bird Park make for a lovely sunset view. In addition to the boat rides, other attractions to the park include the Sihcao Artillery Fort, Dazhong Temple, the whale museum, and the Salt Field Eco-Culture Village. 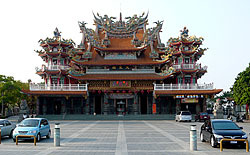 Dazhong Temple is a large, modern-looking temple. It actually dates back to 1700, but not in its present form. It was a much smaller temple then. Now it’s pretty polished and new on the outside, but you can feel its history once inside. It was built to honor those spirits that died in the battles between Zheng Chenggong and the Dutch. The tomb of an unknown Dutchman exists behind the temple. The whale museum is next to the temple. It is rather small and feels run-down, but it only costs NT$10 to enter, so you may as well give it a look if you have the time. Also across from the temple are some walking paths that let you view some mangroves and wetlands on foot. A little up the road (walkable, but more accessible to drive) is the Salt Field Eco-Culture Village. This site attempts to preserve the history of the Anshun Salt Fields. This was Taiwan’s first industrial salt production facility under the Japanese. It dates back to 1919. Salt production has been an important industry since the early days of Chinese settlement in Taiwan. 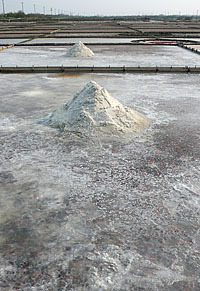 At the Salt Field Eco-Culture Village you can see displays on the salt production techniques of the 20th century. Tours get to see salt-making in action. There are also displays on embroidery and woodworking on-location. The culture zone gives you a nice introduction to the area, but it’s just as enriching to travel around western Annan district on your own. You can drive a scooter or bicycle around the old roads, through the fish farms, and along the estuaries. The culture of the area is still thriving. 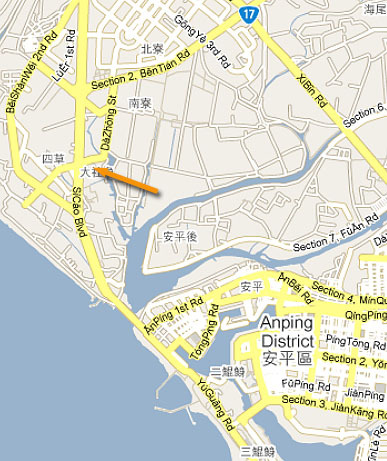 One way to get there is by heading over the Sihcao Bridge near Anping Beach. Follow Sihcao Boulevard north until you see Da Zhong Street (大眾街). Turn right and head towards the Dazhong Temple. when i went to the mangrove tunnel waterway it was so beautiful. It reminded me of those rivers from pictures in Brazil. Barking Deer Adventures doesn’t seem to be in business anymore. Does anyone have a tip for similar services in Tainan? I am especially interested in kayaking through the groove.